Are you celebrating 100 Days of School with your children? 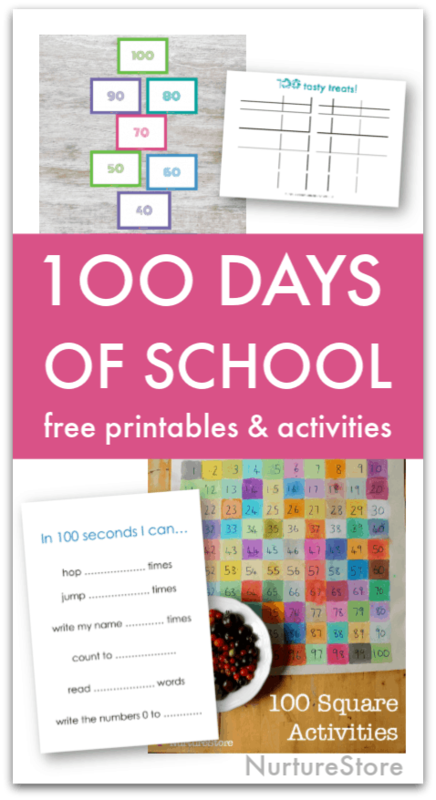 Use these one hundred days of school free printables and hundred day activities to celebrate all the learning they have done. Depending on when you start your school term, one hundred days of school usually falls sometime around the end of January or the beginning of February. You can have a fun themed day at school to celebrate 100 days of learning. All that hard work and practice that your children have put in deserves to be acknowledged. It’s part of a growth mindset to understand that achievement and development takes stamina and practice. Homeschoolers and home educators can celebrate 100 days of learning too of course – perhaps you also follow a back-to-learning timetable that starts each September, or you want to dedicate a day to exploring hundreds, base-ten lessons and the ten times table. January and February can be cold, dark days so I say, any excuse for a party! What can you do in 100 seconds? 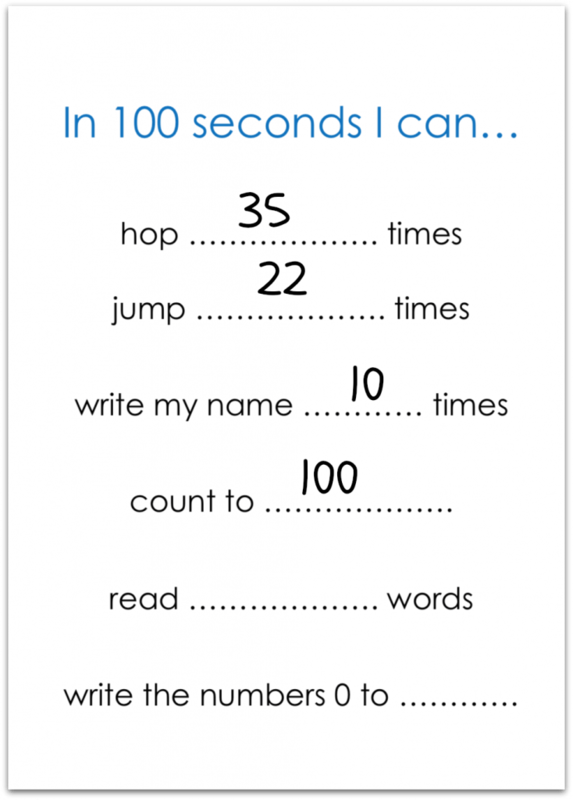 Use these free 100 Seconds activity sheets to see what you can do in 100 seconds. There are two forms per page and you can print (see below) as many as you need for your children. Start the stop watch and see how many you can do! Let’s practise our ten times table as we play hopscotch to one hundred. 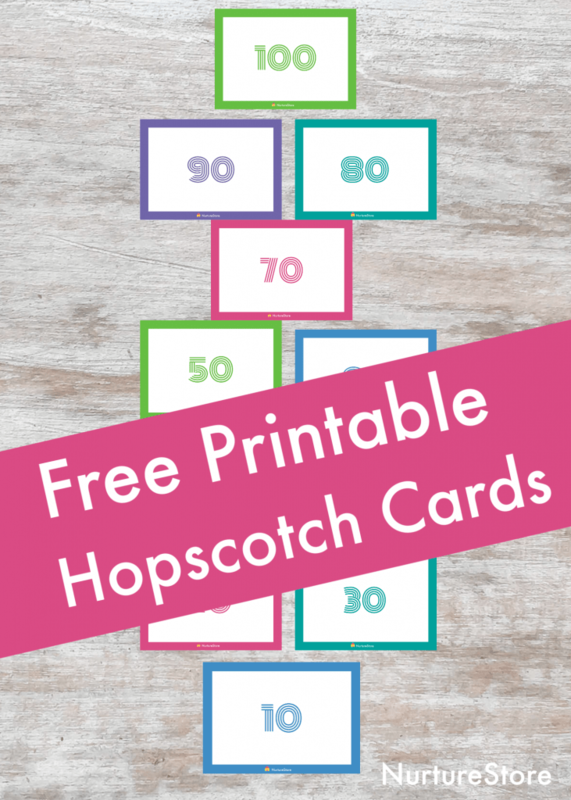 Print these hopscotch cards (see below) and laminate them if you would like for extra durability. Stick them securely to the floor, in order 10 to 100 as shown above, and then invite your children to hopscotch along them. As they hop and jump, have them shout out the numbers they’re landing on. This is a fun active math game that gets children using their brain and body together and makes the repetition-learning fun. How many ways can you make one hundred? Invite your children to count to one hundred. Skip count in 2s all the way to 100. Skip count in 5s all the way to 100. Skip count in 10s all the way to 100. It can be hard for children to visualise exactly how many things make up one hundred. Use these one hundred square activities to help them understand this concept. 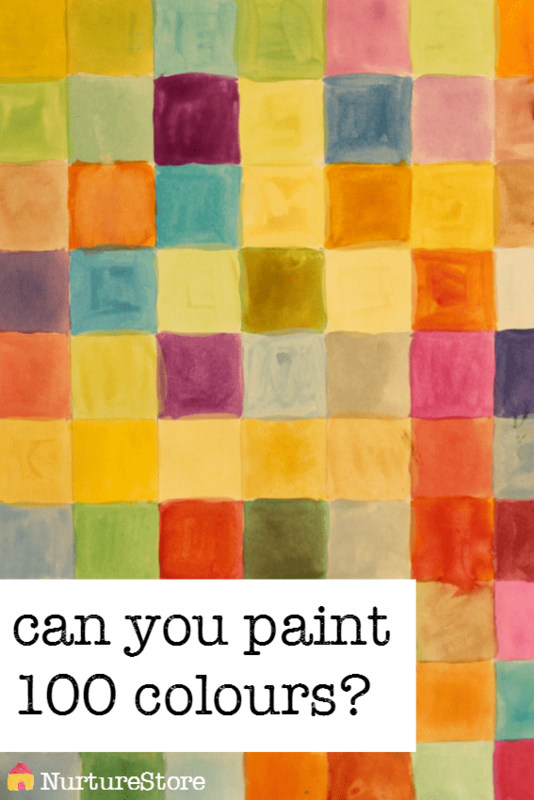 One activity is to paint 100 colours. You can work together as a class to complete your colours, and give each one an imaginative name. You get the best snack time of the year on 100 Days of School Day! Imagine eating one hundred tasty treats! It’s not all that many really, and if you ask parents to contribute items it can be inexpensive even for a whole class. Ideally you want ten different treats, so you can make ten groups of ten for your one hundred treats. 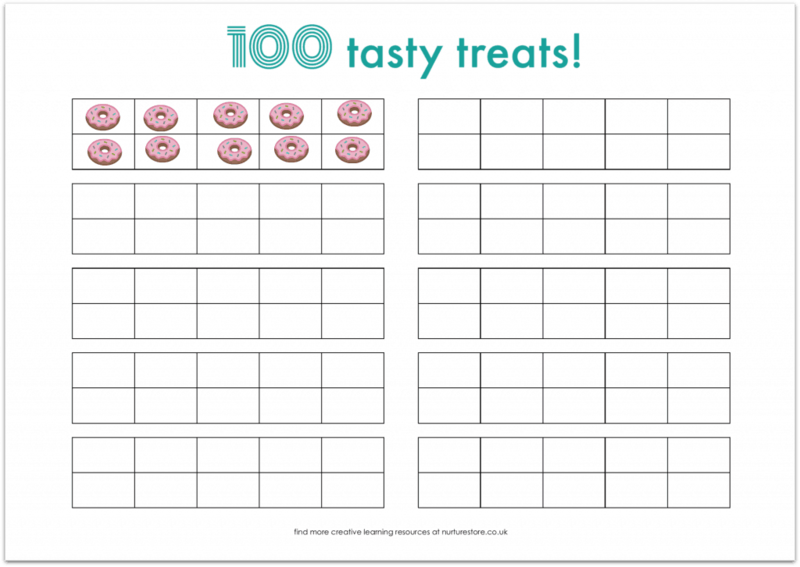 Set out bowls of your treats along with the free 100 Tasty Treats printable (see below) and invite each child to complete their placemat with 100 items. You’ll notice the placemat is divided into base-ten frames, helping children see how one hundred is made up of ones and tens. :: When I woke up this morning my bedroom was filled with 100 _______ so I……. :: I wish I had 100…. / I’m glad I don’t have 100…. :: What can you do now that you couldn’t do 100 days ago? :: What’s 100 miles north, south, east, and west from where we are? :: What will it be like when you celebrate your 100th birthday?